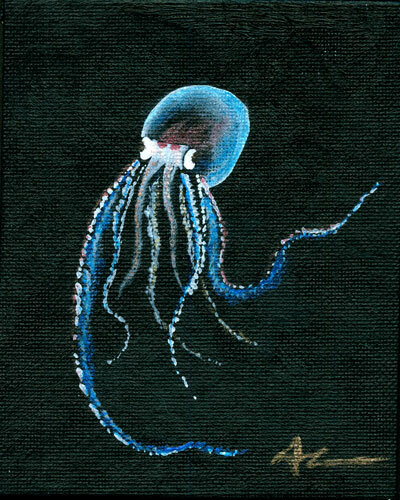 Today’s tiny painting is a Translucent Pelagic Octopus, a deep-sea creature that floats ghostlike in the dark ocean. They have some phosphorescence in blues and reds and even a bit of gold to go with the white, and seem to be sculptures of living glass. Iridescent paint gives the image a big of shimmer, adding to the effect. He’s giving you a cheerful hello wave from his tiny canvas, which is about the size of a postcard. He comes with a small wooden easel to easily display him on a flat surface such as a bookshelf, mantelpiece, desk, cubicle, or very patient cat. Pelagic Octopus, 4″x5″ oil painting on canvas board. Oh, he is so cute! I would call him Randall and buy him spectacles. Hee thank you! I’m sure he’d be adorable in a nice pair of specs.